To the best of our knowledge, no author has published results of this technique till date. Retrospective data of all the patients who underwent terminal chop were collected from October 2016 to July 2018. All the cases were operated by a single surgeon. The case sheets were reviewed and data related to patient demographics, cataract grade, keratometric readings (preoperative and postoperative), intraoperative cumulative dissipated energy (CDE), intraoperative and postoperative complications, systemic illness, preoperative uncorrected visual acuity, and postoperative 1 month best-corrected visual acuity (BCVA) were collected. All the visual acuities were converted to LogMAR scale. Preoperatively, all the cataract cases were given topical moxifloxacin 0.3% with ketorolac 0.4% combination twice daily for 3 days and polyethylene glycol–polyvinyl alcohol (PEG–PVA) combination four times a day for 3 days. Patients with high intraocular pressure (IOP) were given appropriate topical and/or systemic antiglaucoma medications to bring down the IOP and were then operated for combined surgery (single-site phacoemulsification with trabeculectomy). Postoperatively, all the patients were given topical sifluprednate three times daily in weekly tapering dose, gatifloxacin 0.5% three times daily for 30 days, and PEG–PVA combination four times a day for 30 days. In addition, topical nonsteroidal anti-inflammatory drugs, antiglaucoma medications, and cycloplegics were given based on the clinical condition. All the data were recorded in Microsoft Excel Sheet (Microsoft Office, 2013, One Microsoft Way Redmond Washington), and statistical analysis was done using STATA 10.0. Under aseptic precautions and under topical or peribulbar block, the patient's eye is draped and Murdock speculum placed. Phacoemulsification is performed from temporal clear corneal incision with standard surgical steps. Combined surgery is performed through single-site superior or superotemporal incision. Various ophthalmic viscoelastic devices used during surgery are hydroxypropyl methylcellulose 2%, sodium hyaluronate 1.4%, and a combination of 4% chondroitin sulfate and 3% sodium hyaluronate. Continuous curvilinear rhexis of size 5–5.5 mm was created with cystitome and microcapsulorrhexis forceps. After adequate hydrodissection and confirming free rotation of nucleus, phacoemulsification probe of 2.2 mm size (Infiniti OZiL 15 degree tip; Alcon Surgical, USA) is inserted with bevel up. Phaco parameters used were as follows: bottle height of 70–110 cm, vacuum ranged from 150 to 400 mm Hg, aspiration rate of 22–40 mL/min, and torsional power of up to 100%. After completion of capsulorhexis, a short superficial central trench of 1 × 1 × 1 mm size is created to hold and engage the phaco tip. Once the trench is complete, phaco settings are changed to high-vacuum settings (450 mm Hg) with 50% power and 35 mL/min aspiration flow rate. Phaco tip is engaged at the distal end of the trench. Then phaco probe is impaled superficially keeping the tip directed toward the equator, parallel to the pupillary plane to achieve firm hold of the nucleus just within the equator. The equator is drawn within the capsulotomy edge, and under direct visualization a wedge-shaped blunt olive tip chopper “terminator” [Figure 1] is simply passed around the lens equator and hooked around the equator adjacent and parallel to the phaco probe. The terminator is then simply dragged 1.5–2 mm through the open edge equator to create a small groove. Dragging generates tension and a dispersive force along the sides of the groove which is consonant to drag pick in rock excavation system and initiates a full-thickness nuclear crack. This full-thickness crack traverses automatically across the lens to the other end of the equator and divides the nucleus into two equal halves [Figure 2]a. Instead of the “terminator,” the authors have used blunt chopper [Figure 2]b for performing terminal chop. The blunt chopper has a 90° bent tip with knob at the end. In the bag, phacoemulsification is completed and cortex aspirated by bimanual irrigation and aspiration. Foldable IOL is placed in the bag. The tunnel and the side port are hydrated. Subconjunctival dexamethasone with gentamicin is given. Speculum and drape are removed. The eye is patched with one drop of moxifloxacin. The patients are followed up on days 1, 7, and 30 postop. A brief summary of demographics and the average of different peroperative parameters are mentioned in [Table 1]. The majority of the patients were male with an average age of 61 years. The grades of nuclear sclerosis operated ranged from 2 to 5 with the majority being grades 2 and 3. Preoperatively, 32 cases had pseudoexfoliation. Phacoemulsification was done in 850 cases and the remaining 83 cases underwent combined surgery (single-site phacoemulsification with trabeculectomy). A total of 86 cases had preoperative IOP more than 21 mm Hg, of which 79 cases underwent combined surgery. Eight cases had posterior capsular rent and five had rhexis injury from the chopper. One month after surgery, there was significant change in visual acuity (p = 0.000) and horizontal and vertical meridian keratometry (P = 0.000). CDE was significantly more in harder grade of cataract [Table 2]. 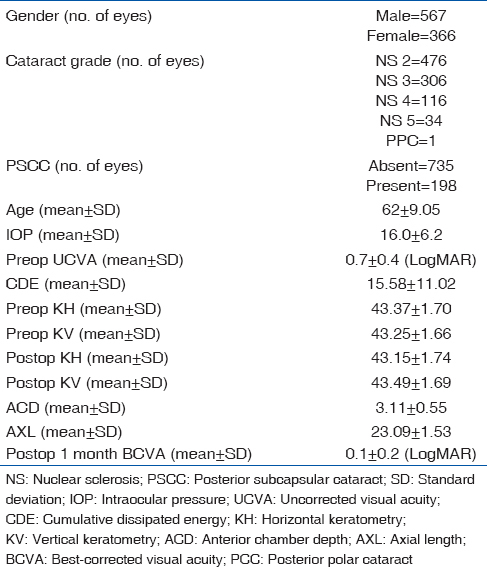 Preoperative visual acuity was inversely related to the grade of cataract [Table 3]. There was no significant difference in 1-month BCVA between different cataract grades. Also, there was no significant difference between preoperative visual acuity and 1-month BCVA of patients who underwent phacoemulsification versus combined surgery. However, CDE was significantly lower in patients who underwent combined surgery (P = 0.01). Postoperatively, 12 cases had mild corneal edema and 7 cases had moderate corneal edema [Table 4]. All these cases had pseudoexfoliation in preoperative evaluation. Similarly, 11 cases had mild anterior chamber reaction and 3 had moderate reaction which resolved completely on day 7 visit [Table 4]. Terminal chop is a new technique for nuclear fragmentation., As per the inventors of this technique, mechanics of nuclear segmentation is very simple, swift, safe, and highly effective with least manipulation and minimal energy consumption. This ensures less endothelial cell loss and less postoperative inflammation, with faster recovery and maximal visual rehabilitation. Studies have been done to compare the effect of different nuclear fragmentation techniques  on endothelial cell loss. We did a retrospective observational study to further verify the said benefits. Patients with concomitant glaucoma or pseudoexfoliation  are at an increased risk of intraoperative complications and this risk is further aggravated with the concurrence of higher grade of nuclear sclerosis. Phacoemulsification in such cases requires techniques which reduce the stress and strain on capsular bag and zonules. Previously described techniques of nuclear segmentation such as direct chop  and stop and chop  many a times leave the posterior lenticular plate nondissected. Thus, terminal chop  plays an important role in such cases. A total of 933 patients were operated between October 2016 and July 2018. The majority of the patients underwent plain phacoemulsification and 10% of the patients underwent combined surgery. Pseudoexfoliation was noted in around 3.8% of the patients which is a significant proportion. All the patients achieved a significant visual improvement at 1 month postop, and intraoperative complication rate was significantly low (1.54%). Videos 1, 2, 3, 4, and 5 show representative cases of terminal chop with grades 3, 3+, 4, very hard cataract, and mature sclerotic cataract, respectively. CDE ranged from as low as 1.07 to 86.93, and the total ultrasound time ranged from 38 s to 2 min 20 s with an average of 1 min 2 s. Higher grade of cataract needed more CDE as expected. Even though preoperative visual acuity was inversely related to the grade of cataract, the final 1 month visual acuity was not affected by the grade of cataract. On comparison of CDE between plain phacoemulsification and combined surgery, it was observed that the combined surgery patients required significantly lower CDE (mean 12.02, P = 0.03). This was due to the presence of significantly lower grade of cataract in patients undergoing combined surgery (P = 0.005). This denotes that terminal chop is an effective technique irrespective of the grade of cataract, and the phacoemulsification energy required is well within the acceptable limits. Terminal chop has been described for hard cataract only, but in our study we performed the chop in medium grade of cataract (grade 2+) also. The authors experienced increased level of ease and comfort along with reduced duration of surgery for medium grade cataracts. The grade of cataract was similar in diabetic and nondiabetic patients (P = 0.76). Preoperative and final visual acuity, intraoperative complications, and CDE were also similar among diabetic and nondiabetic group of patients (P > 0.05). Even the first day postop corneal edema and anterior chamber reaction were not significantly different in diabetic patients (P > 0.05). Since the study was aimed at analyzing the outcome of terminal chop, we did not collect detailed data related to the combined surgery patients. Thus, commenting on the success of combined surgery is not feasible as per the study results. 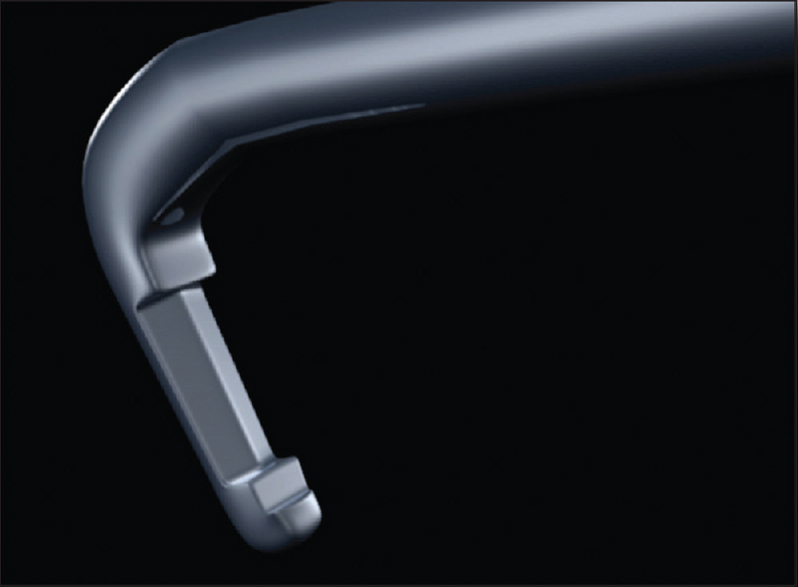 In conclusion, terminal chop is an effective, reliable, reproducible, and safe technique for nuclear segmentation of different grades of cataract (grades 2–5) in both phacoemulsification and combined surgery. Prasad R, Badhani A, Dogra GB. Terminal chop: New technique for full thickness nuclear segmentation in mature hard cataract. Indian J Ophthalmol 2017;65:1415-8. Prasad R, Badhani A, Badhani G. Rajendra Prasad's terminal chop: New technique for full thickness nuclear segmentation in hard cataract. Delhi J Ophthalmol 2016;27;41-3. Gimbel HV. Divide and conquer nucleofractis phacoemulsification: Development and variations. J Cataract Refract Surg 1991;17:281-91. Koch PS, Katzen LE. Stop and chop phacoemulsification. J Cataract Refract Surg 1994;20:566-70. Chang DF. Converting to phaco chop: Why? Which technique? How? Ophthal Pract 1999;17:202-10. Jaeger JC, Cook NG. Fundamentals of Rock Mechanics. 3rd ed. London: Chapman and Hall; 1979. Bourdin B, Francfort GA, Marigo JJ. Numerical experiments in revisited brittle fracture. J Mech Phys Solids 2000;48:797-826. Griffith A. The Phenomena of Rupture and Flow in Solids. Vol. 221-A. London: Philosophical Transactions of the Royal Society; 1920. p. 163-98. Chiotoroiu S, Pandelescu M, Epure C, Stefaniu I. [Comparative study of endothelial changes in cataract surgery with phacoemulsification technique]. Oftalmologia 2008;52:95-9. Belovay GW, Varma DK, Ahmed II. Cataract surgery in pseudoexfoliation syndrome. Curr Opin Ophthalmol 2010;21:25-34.